Whether used on a desk or a counter, these colorful African baskets are mesmerizing. 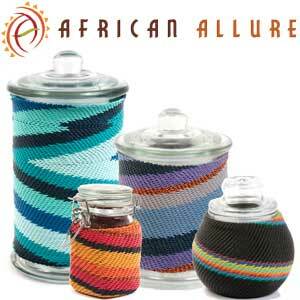 Created by Zulu weavers, these incredible, intricately-designed baskets were originally woven from telephone wire. Today modern and vibrant plastic-coated wire is tightly woven into swirling patterns. You will receive the exact jar and baskets pictured above. The jar is glass, with an air-tight lid. The cup-shaped piece is handy for holding toothbrushes or pencils. The oval is a nice size for a bar of soap or a set of keys. The past and the future are fused together in the creation of these beautiful pieces. 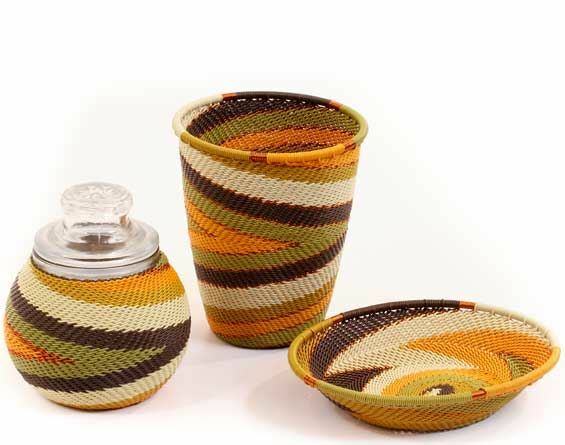 Zulu weavers have taken the intricate designs and incredible craftsmanship of their natural fiber baskets and turned them into brightly-colored art using plastic-coated wire.